I think it is fair to say that while Johnny Ramone was the sanest member of THE RAMONES, he was also the most dictatorial and, possibly, the nastiest. While he has been chastised in places for his totalitarian, Right Wing Conservative ideals and Pro-American patriotism, we should be thankful he was at the helm of a band riddled with mental illness, dysfunction and addiction. This autobiography of the late Johnny Ramone is as acerbic and cutting as the man himself always appeared, yet there is a stark honesty and wit about his words that have rarely surfaced in his public persona. 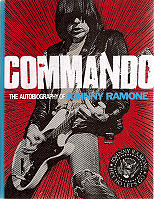 The book starts with a prologue, written by Ramone, thats indicative of what is to follow as he states that he beat up Malcolm McLaren, beat up his bandmates Dee Dee and Joey and, in a shocking slice of honesty, admits that he got a NYC Cop to release a large can of Mace into a RAMONES audience. Its a blunt opening displaying Ramones ambivalence towards what people may think of him. A good proportion of the book is dedicated to his early days and makes for excellent reading as he tells of his closeness to his father and of the infamous rebellious nature that appeared early on. He doesnt gloss over his mean streak; he states that he had a two-year violent streak during which he was, "just plain bad," while his views on the Vietnam situation could be summed up with the statement that the US should "bomb the place into oblivion." From there it moves onto his ill-fated first marriage and to his vision that he had to get his life together, which lead to the formation of THE RAMONES. The story of the band is a familiar one, of course. Its been told many times in other books, but the Johnny Ramone perspective adds a new dimension to it. His well-documented friction with Joey Ramone is not as sensationalised as it appears in other books; here Johnny makes it clear he had little time for Joey socially but fails to display the animosity that the RAMONES legend has created. His on-road stories, while probably not intending to be, are as funny as anything Dee Dee has ever written be it having two stress factors on a European tour - one was sharing a van with TALKING HEADS while the other was Europe itself (with France in particular being "unbearable"). Other notable comments include Stonehenge being just a bunch of rocks and that capital punishment should be televised. There is also a first-hand account of the vicious attack he suffered on the NYC streets. The book, and to a degree Ramones attitude, takes a notable shift in mood when he starts to write about the cancer that finally killed him. Its brutally honest writing; I had to stop reading in parts due to the graphic reality and emotional gravitas of his situation. His actual passing is written about by a number of his closest friends. In many ways, this makes for slightly surreal reading. Here is an autobiography being written by a man who is aware of his imminent death but released several years after his actual passing. As a document of Johnny Ramones life, the book is a concise and unflinching testament uncluttered by any fanciful word play. As another chapter in the epic history of THE RAMONES it lacks the hyperbole of Dee Dees telling and doesnt dwell on the Joey Vs Johnny feud that Mickey Leighs (rather excellent) I Slept With Joey Ramone could be guilty of.